I am so impressed with the work my students are doing! I am excited to see how they apply the techniques I teach in class, as well as the techniques the learn from other instructors. Many students have their very own style and signature in their work and this is one example. 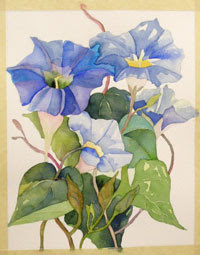 We painted some morning glories in class a few weeks ago. One student went home, started a new piece on her own with her own photo references and created this lovely piece. It really has charm and character! I just love the freshness of it and the delicate blending of her colors. Great Job Lin!!! For information on my classes click here.